I caught a re-run of that once popular show, Family Feud, the other day. I love that game, and the challenge of the split-second answer after Richard Dawson would say, “100 people surveyed, top 6 answers are on the board”. The premise of the show, for those 5 people reading this who may not know, is contestants are asked to name the most popular answers to a question asked to a group of 100 people. Note: they are not asked what the answer is. They are asked what they think are the most popular answers to the question. It got me thinking. You don’t see a lot of rocket scientists, astrophysicists, and triple PhD’s on the show. Well, maybe you do. But they never get the answers right. That’s because the first thing that pops into those brains are not what the rest of us are thinking. “Active Galactic Nucleus” is never going to top “martian” on a survey list of answers to “Name five things you would find in space.” Unless, of course, the survey group actually was a bunch of astrophysicsts. You know which people generally do well on this show? Marketing folks. The core of our job is to figure out what will resonate most with our target audiences. What are the most unfilled needs and wants that our product/service fulfills? What are most audiences willing to pay? What and where are the most effective messages can we deliver for our audience to see that our product/service fulfills a need or want that they have? Our success as marketing professionals depends on our ability to understand what resonates most with the majority of our market. 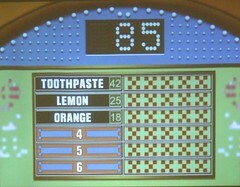 Just like in Family Feud, we must always be focused on “the most popular answers on the board”. Not necessarily what we think is the “right” answer. Unless, of course, the “right” answer is what the average person in our market thinks the answer is. This entry was posted in Professional Services Marketing and tagged flipside workspace. Bookmark the permalink. Now I’m comparing everything to Family Feud! I don’t know whether or not to thank you! Ha! I love it, Family Feud as a verb!